I must apologise for not writing on my blog for a few weeks. 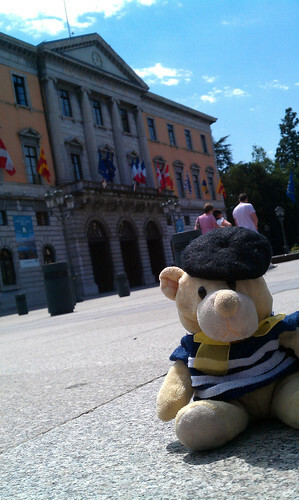 We have been back from France for a while now but it has been really busy round here with one thing and another. Also, I had to go in the washing machine and it has taken me a while to recover from the experience. So here I am now and I have finally secured one of the humans to do some typing for me. 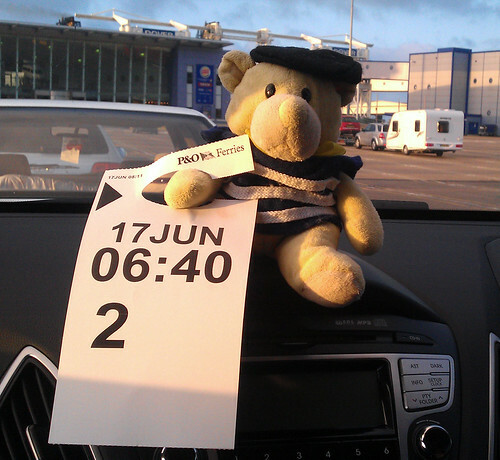 Waiting for the ferry … yawn! We finally arrive in Saint Jorioz at about quarter past five in the evening and oh my it’s hot to be putting up a tent – about 28 degrees. Our tent is new and we’ve had just one practice run at putting it up at home. It all seemed to go together well, apart from one troublesome tent pole at the front that kept jumping off it’s retaining pins, but in the end the hooms get it sorted and we are all very pleased with the end result. 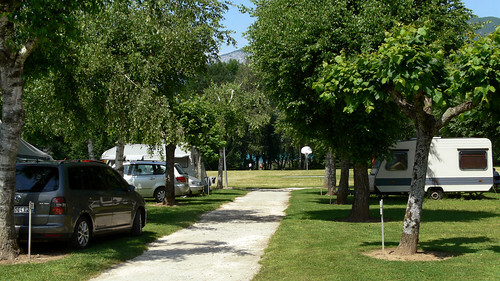 Our campsite is called Camping le Solitaire du Lac d’Annecy and it really is very nice. 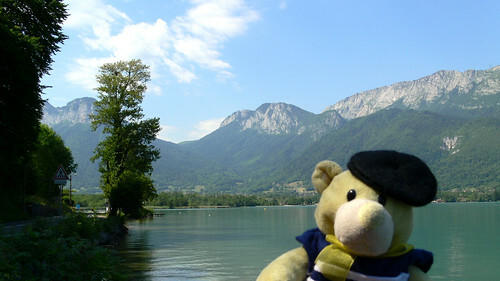 Lake Annecy is just at the bottom of the site through the trees so after putting the tent up we decide to go and sit down somewhere by the lake to cool down and have a rest. Just along the shoreline to the right is a small pebble beach with a jetty. The hooms sit and dangle their feet in the lake which they say is lovely and cool but my feet won’t reach which makes me sad. A small bears needs are so often unaccounted for. We’re all pretty tired by now (though I admit I haven’t really done very much myself) so there’s just time for some dinner and then we go to bed. The next morning we wake up to the lovely jingling sound of Alpine cow bells from the field next to the campsite as the herd come down to the field from their barn. I don’t recall ever hearing cows with bells in England. 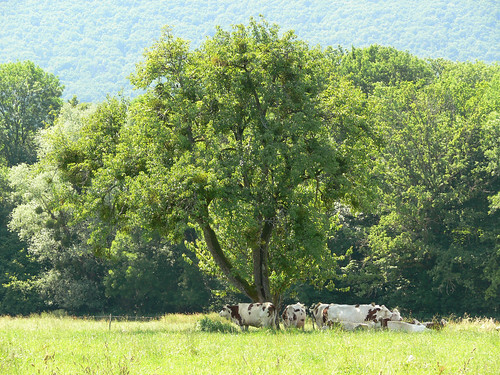 Perhaps these cows are particularly troublesome and sneak up on you, so they fit them with bells? They look like huge beasts though … you would be hard pushed not to realise one was behind you. After breakfast we are visiting the town which gives the lake it’s name. It is just 9km from St Jorioz but we decided to take a drive in the opposite direction and go right the way around the lake and go to Annecy that way. The road stays near to the shore most of the way and it’s all very picturesque. The road is easy enough to follow – the D1508 towards Albertville, then a left turn just past the bottom end of the lake onto the D909A and D909 toward Talloires. The only place the road really goes away from the lake is between Talloires and Menthon Saint Bernard as the area by the lake is a huge nature reserve. 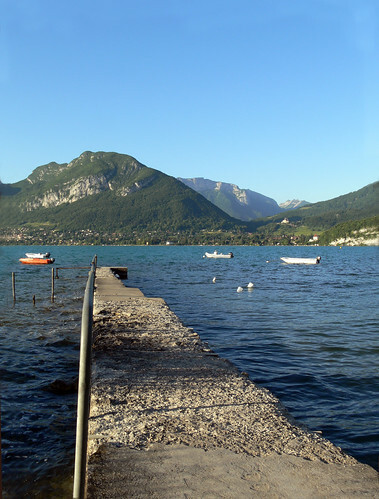 Following the road round the lake from Menthon Saint Bernard, you pass through Veyrier du Lac and then the shoreline of Annecy Le Vieux before reaching Annecy itself. It is really busy by the lake as it is a lovely day and most of the shoreline here has large grassy areas where people can sunbathe or play games or my favourite pastime – have a picnic! For practical purposes it would be useful to get some sort of town map to help you navigate. There are plenty of carparks but if you want to be close to the main part of the old town and the shore then head towards the Hotel De Ville underground carpark. Here is a link to lots of maps around lake Annecy – the Annecy city centre plan will help you lots. 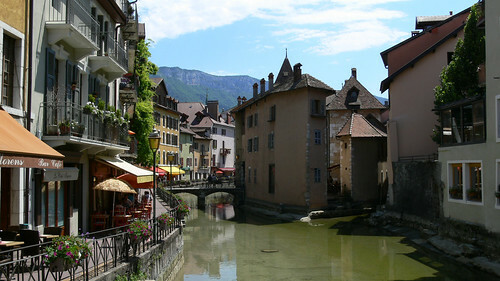 Annecy is really pretty. 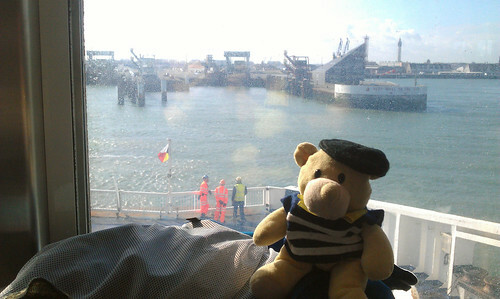 One of the hooms says it looks a little like Venice. They do boat trips around the lake so we’re going to come back later in the week to go on one. What a lovely day we had around the lake. 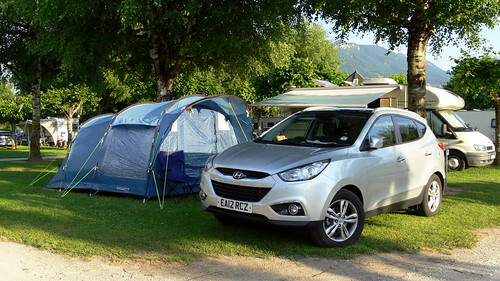 In my next post I’ll be telling you all about La Semnoz near Saint Jorioz and the Gorges du Fier near Annecy.